Yogurt drink with L. Casei Danone cultures, vitamins B9, B6, D and yerba mate. No added sugar - contains naturally occuring sugars. 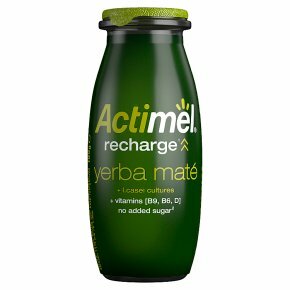 Recharge1 Yerba Maté is the infusion from South America long called the 'drink of the gods', which we blend in perfect balance with delicious yogurt containing billions of L. Casei cultures. We also add 1vitamin B9 to help reduce tiredness and fatigue. A shot bursting with herbal flavours to give a kick to your taste buds.